Guy Beahm who is more known as Dr DisRespect, an online alias which he adopted, is an award-winning Twitch.tv streamer. He has leveraged on the Twitch platform to become an internet personality that is quite widely known. Dr DisRespect is just more proof that anyone who is good at what they do can attain celebrity status in this day and age. Practically all his popularity and earnings come from playing games and utilizing the streaming platforms available to him to amass an impressive following that translates to stardom and huge bucks. Dr DisRespect was born on March 10, 1982, as Guy Beahm. Not much is known about Guy Beahm before he embraced the Dr DisRespect character. For instance, his birthplace is unknown although he has currently settled in Washington. It is however known that Guy Beahm graduated from Califonia State Polytechnic University in Pomona. While at university, he played Division II NCAA basketball. His rise as an internet personality started from playing Halo 2 on the XBox. With the XBox, he had access to proximity voice chat which enabled him to engage with other players in real time. He took the opportunity to showcase a character of dominance which was helped by him being good at the game. By January 5, 2010, Guy Beahm and his roommates had decided and begun posting content on YouTube. This initial steps led to Beahm being given the post of community manager of Sledgehammer Games. He rose through the ranks, hitting level designer which was how he helped create a number of the multiplayer maps for Call of Duty: Advanced Warfare. He left Sledgehammer in 2015 after he had joined Justin.tv so that he could focus his full attention on streaming. His initial momentum in gathering followers was built by playing battle royale games, starting with H1Z1. Soon enough, he turned to PlayerUnknown’s Battlegrounds then followed up with Fortnite. To date, he has built a following of over 2 million on Twitch.tv where he is seen as a larger-than-life personality called Dr DisRespect. Dr DisRespect is often viewed not necessarily as a professional gamer but as a person who entertains in the streaming industry. As such, his looks are very important to his persona. 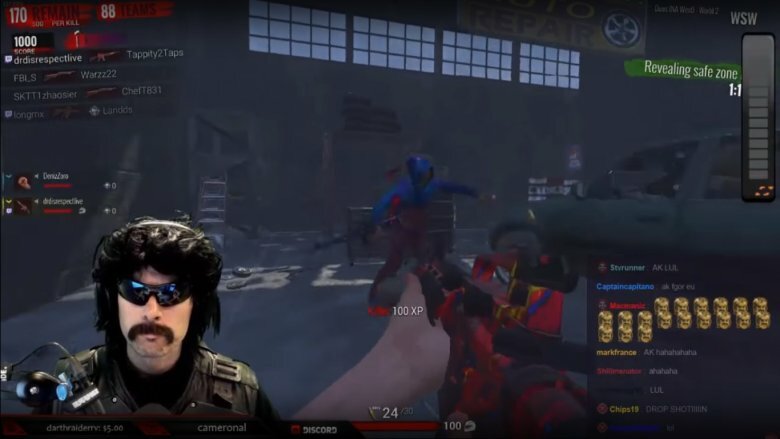 The Dr DisRespect character has been described as looking like a professional wrestler with the adopted appearance of cool sunglasses, tactical vests, and a large mustache. Over time, Dr DisRespect has actually fallen to the number 2 spot in popularity on the platform behind Ninja but he is still considered the “face of Twitch” most of the time. Along with well-delivered one-liners, Dr DisRespect’s height is yet another thing that he is constantly described with. The character stands at 6’8″, and possesses a 37″ vertical leap. Like his parents and family life prior to the fame, Guy Beahm has managed to keep his immediate family out of the public discussion for the most part. Fans are only saved from mistaking him to be unmarried by the numerous mentions that his wife and daughter get on his Twitter page and also the unfortunate event of him cheating which he announced in December 2017. The controversial gamer seems to be a family man considering that he recounted to his fans tearfully, the occasion of his infidelity in December 2017. The announcement culminated in him stating that he was taking some time off to focus on his family. The time off seemed to have paid off as Guy Beahm came back on the platform two months after the announcement with a return stream that clocked 388,000 viewers. His wife also joined Twitch with her own character that she dubbed Mrs Assassin. Speaking with Rolling Stone about that time of his life, he said that his wife joining the platform was necessary both professionally and on the home front as they had been on the brink of separation and even divorce. He also said that he should have involved his wife earlier as his mistakes still had an effect on their relationship and his relationship with his daughter. He shared hopes that their working together would help strengthen their personal relationship again and his bets seem to be paying off as the family continues to stay together even as the couple plays together.